The welding horn is the element of the welding stack that supplies energy to the component being welded. Design of the welding horn is critical to successful welding. It is strongly recommended that welding horn manufacture should only be carried out by companies specialising in ultrasonic welding. The welding horn, like the booster element, is a tuned device, which, in the majority of applications, also provides mechanical gain. It is typically manufactured in either aluminium or titanium. Aluminium welding horns tend to be used for low volume applications since wear can be a particular problem with this material. Some welding horns have specially hardened tips to reduce wear during welding. 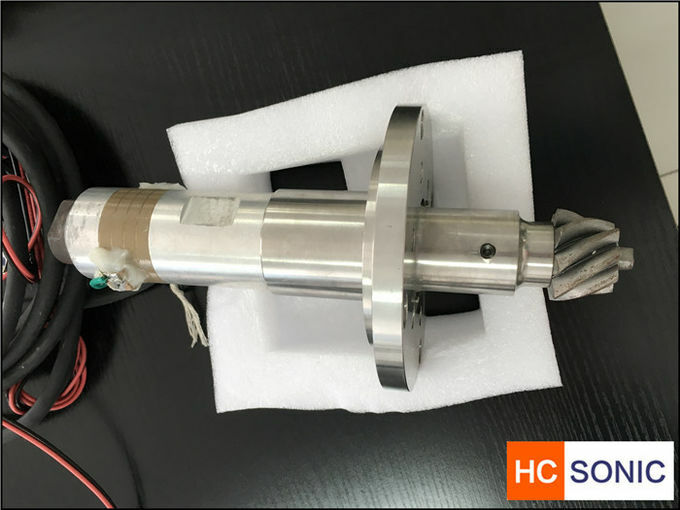 As with the booster element, the length of the welding horn must be either one half of a wavelength of ultrasound in the material from which it is manufactured, or multiples of this length. This ensures that there is sufficient amplitude at the end of the welding horn to effect welding. The amplitude is typically between 30 and 120µm. The shape of the welding horn is important since stress, caused by the axial expansion and contraction of the horn, could lead to cracking in high amplitude applications. In some applications the welding horn is manufactured with slots in the axial direction. This is to ensure that the maximum vibration amplitude is in the longitudinal direction. The tip of the welding horn delivers the ultrasonic energy to the component being welded. The tip should be specifically designed to match the component. This will ensure that maximum energy transfer between the horn and the component is achieved. Usually, the tip of the horn is profiled to match the contours of the component. The sonotrode or weld horn, the most critical and influential component in the set that contacts the plastic part, is designed to provide the optimum contact area and amplitude of vibration to the parts being welded. In concert with the booster, the amount of amplitude of vibration can be tailored to a specific plastic polymer material and, less important, to the geometry to the part. Various polymers require different amounts of amplitude to be welded based on many factors but primarily, on their glass transition temperature or melt point and “stiffness” or loss modulus. Acrylic is the easiest to weld due to its low Tg and relatively high stiffness. On the other hand, polypropylene with its semi-crystalline structure being able to absorb vibrations (high loss modulus) and being relatively soft with a high melt point is harder to weld, particularly in thin wall structures. The overall sonotrode design is driven by the final application to a high degree. Sonotrodes are made of either titanium, aluminum, or hardened steel of various grades to suit the final use. Titanium is favored for its high rate of transmission of sound waves, durability, and relative hardness. Aluminum can be used and has a much lower cost in regard to material and machining. 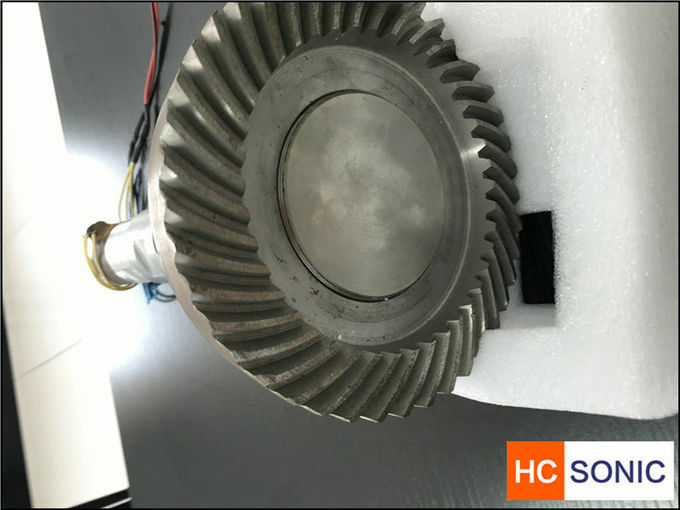 However, it suffers from being relatively weak and because of its oxidization, causes marks on the plastic parts and subsequent need for some type of plating. Steel is very stiff and hard and is used in applications that are abrasive to the sonotrode surface such as welding of glass-reinforced materials, i.e., glass-reinforced nylons in automotive applications. Steel must be put through a heat treating process to allow it to transmit ultrasonic vibrations so a further cost is incurred. 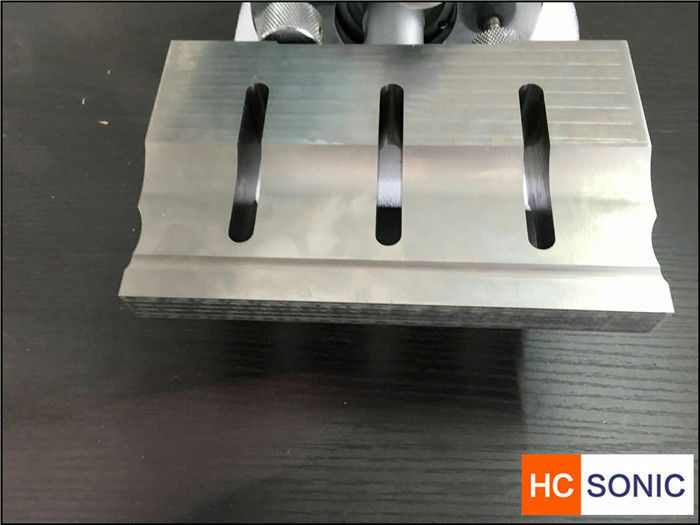 Thus, the choice of materials is dependent on many factors, including cost, how many cycles or welds it will make, required lead time, the material to which it will contact, production cycle, etc. The design of the sonotrode is based upon the part's material and shape. Again, the amount of amplitude is calculated in concert with the converter output, booster gain, and sonotrode gain, and the proper amount is introduced into the part. Too much amplitude and the process will be unstable, as the weld will occur too quickly and damage may be caused to the part. Too little amplitude and the weld will not occur uniformly and consistently, weld times will be too long, and the part may be damaged by the introduction of energy into the top of the mating part rather than into the joining area between the two parts. The design of these tools is best left to those with the knowledge, experience, and the required electronic testing devices to make them correctly. Damage arising from incorrect tuning can mean catastrophic failure to either the converter and/or the generator and can get very expensive. Sonotrodes must be tuned to run correctly at the frequency of vibration that is output from the generator causing the vibration of the converter and booster. The damage alluded to can result if the generator/converter cannot run the sonotrode at the frequency for which it is designed. Large power draws can occur at the incorrect frequencies and damage these other components. Sonotrodes, like boosters, are tuned to run at that frequency. An analogy would be the tuning of a musical instrument. With proper tuning, a sonotrode runs with minimal power and 100 percent of the energy is used to vibrate longitudinally at the specific frequency +/- a small bandwidth either side of the generator output.